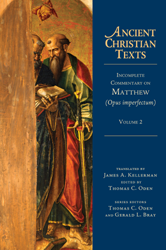 Editors: Kellerman, James A. and Oden, Thomas C.
Despite some gaps in coverage, the Incomplete Commentary on Matthew has long been prized for its early and lengthy exposition of the Gospel of Matthew. Thomas Aquinas noted that he would rather have a complete copy of the Incomplete Commentary on Matthew than to be mayor of Paris. Offered here for the first time in English translation is a wonderful resource designed for pastors, teachers, students and lay people interested in the early church's interpretation of Matthew's Gospel.